Mended Hearts, Chapter 216, Mission Viejo, CA Donates four Automated External Defibrillators (AED’s) to the City of Mission Viejo Recreational Facilities. 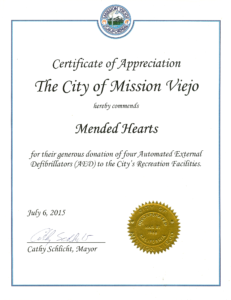 Our second recognition was July 6, 2015 Mission Viejo City counsel meeting we received a Certificate of Appreciation from The City of Mission Viejo, Mayor Cathy Schlicht. “Hereby commends Mended Hearts for their generous donation of four Automated External Defibrillators (AED) to the City’s Recreation Facilities.” In attendance were several of our Board of Directors including Dennis Galloway; President, Barbara Lane; Visitors Chair and her husband Bob, Dee Nangle; Visitor Co-Chair, Dave Lindsay; Newsletter Editor and Grace Belletti; Membership Chair. 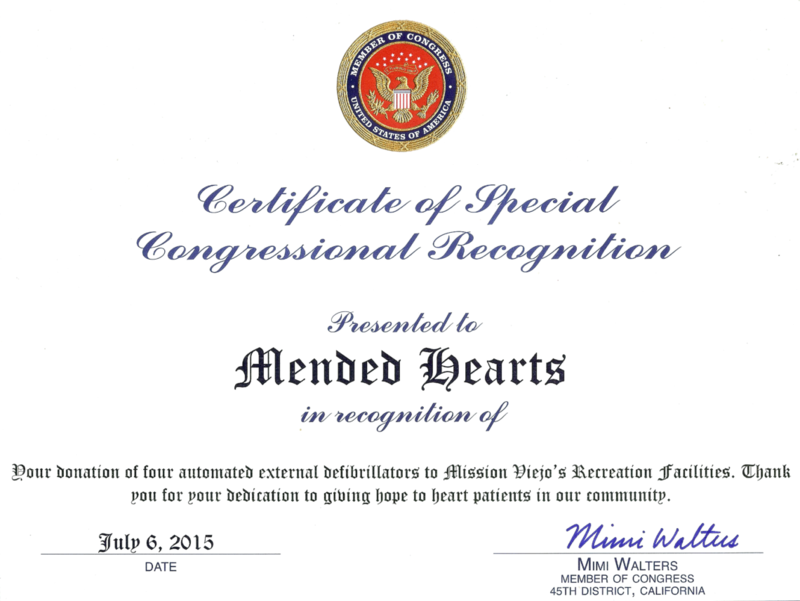 Mended Hearts, Chapter 216, Mission Viejo, CA Donates AED’s to Capistrano Unified School District, Middle Schools. 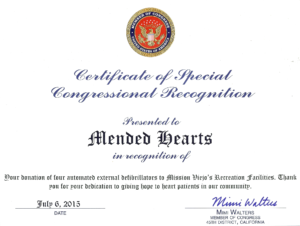 Mended Hearts, Chapter 216 community out reach program has made its first donation of two Phillips Heartstart Defibrillators to the Capistrano UnifiedSchool District. 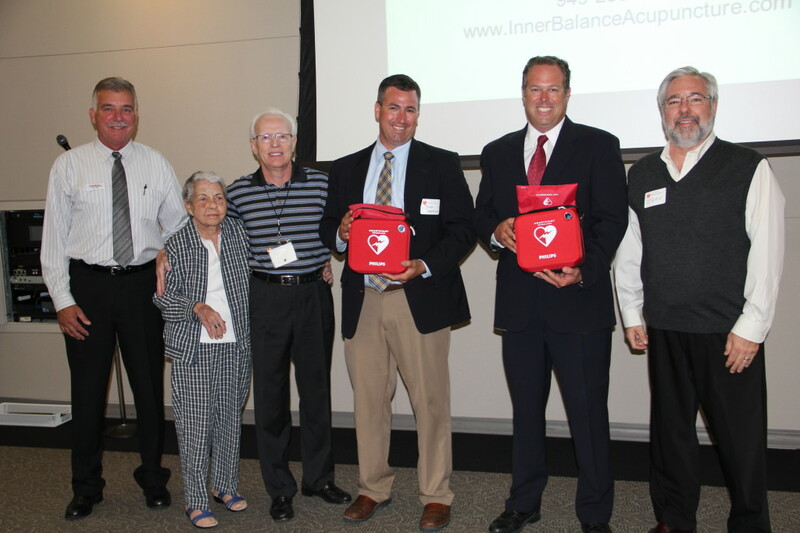 The defibrillators were gifted to Don Juan Avila Middle School in Aliso Viejo, CA, received by Josh Wellikson, Principal and to Newhart Middle School in Mission Viejo, received by Jeff Jones, Principal, at the Mended Hearts May 19, 2014 monthly meeting held at Mission Hospital Conference Center. From left to right; Bryan Flynn, The LifeTrends Group, Dee Nangle, Mended Hearts, Vice Chair, Visitors, Dennis Galloway, President, Board of Directors, Mended Hearts, Josh Wellikson, Principal, Jeff Jones, Principal and Jeff Gotro, Vice President, Board of Directors Mended Hearts, Chapter 216.